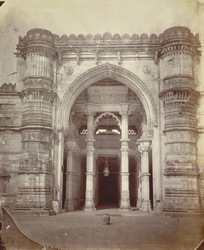 Photograph of the Jami Masjid at Ahmadabad in Gujarat, taken in c. 1881, for the Archaeological Survey of India. The Jami Masjid at Ahmadabad was built by Sultan Ahmad Shah (r.1411-42) and completed in 1424. The courtyard of this imposing structure is entered from the north side. The prayer hall is supported by 260 columns that divide the interior into 15 bays, each covered in a dome. The central domed area is raised to three storeys, the side aisles have two storeys, and the wings are one storey high with open fronts. This is a view of the main entrance of the facade, once flanked by two minarets. These tall 'shaking minarets' collapsed during an earthquake in 1819; the remains were finally demolished by an earth tremor in 1957.